Does Baking at High Temperatures Kill Mold on Cheese? It can be frustrating to get cheese you've spent good money on out of the fridge, only to find it's gone moldy. You probably know you shouldn't eat moldy cheese, but you might be tempted to try to kill the mold by baking the cheese at high temperature. Although baking won't make your cheese safe to eat, all is not necessarily lost. Once you understand how heat interacts with moldy cheese, and the different ways mold affects the cheese itself, you may be able to use other techniques to save your cheese. Heat does kill mold, and it doesn't take a blistering hot oven to do it. According to Ohio State University, most molds cannot survive above 140 degrees Fahrenheit. This, reports the university, makes heat an effective method for controlling mold that occurs in garden mulch. However, there are some good reasons you shouldn't use heat to kill mold on cheese or, for that matter, any other food. Though mold itself can't survive high temperature, there's a reason why the FDA doesn't recommend baking moldy cheese. According to "Cooks Illustrated," toxins produced by mold are far less sensitive to temperature changes than mold itself. When you pull your cheese out of the oven, the mold will be dead, but the poisons that can make you sick will still be there. However, there are other ways to save some moldy cheeses. Sometimes, you can save moldy cheese by cutting out the contaminated areas. "Cooks Illustrated" recommends trying this only with hard, aged cheeses such as cheddar or Parmesan, and removing at least an inch of cheese around the mold. Mold toxins are water-soluble and can penetrate deeply into soft, watery cheeses but not into hard, dry cheeses. Also, make sure not to let the blade of your knife touch any of the mold. If this happens, thoroughly wash it before doing any more cutting. Not all mold is harmful. Cheese makers intentionally inject certain types of mold into their cheeses. 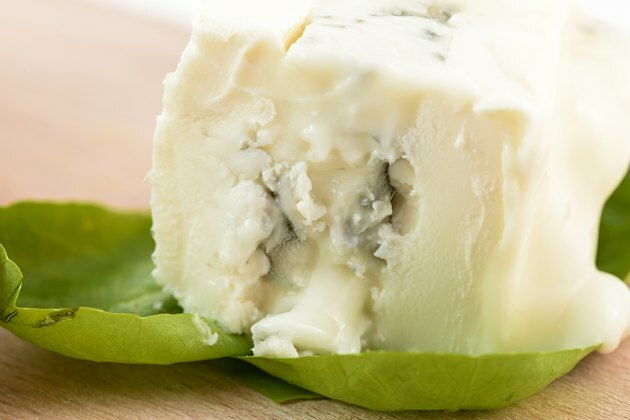 Mold is what gives real blue cheese its trademark flavor, for example. However, it's important to note the difference between normal mold and spoilage. Different colored molds, or a sour smell, mean the cheese has gone bad. If it's a hard cheese, you can cut out the mold, but if it's soft, like blue cheese or feta, discard it.